Atheneum Books for Young Readers, 9781481431675, 40pp. 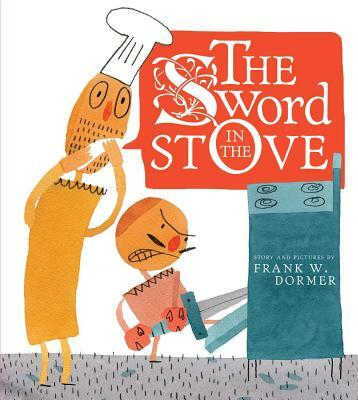 Two knights have their dinner plans derailed as they discover object after object in their stove—objects that ominously belong to their missing friend, Harold—in this delightfully slapstick picture book. Someone has put a sword in the stove. WHO WOULD PUT A SWORD IN THE STOVE!? Frank Dormer’s rollicking whodunit has bumbling characters worthy of The Three Stooges, sly humor straight out of Monty Python, and an irresistible screwball spirit all its own. Frank W. Dormer is the author-illustrator of The Sword in the Stove, Firefighter Duckies!, Socksquatch, and The Obstinate Pen. He is also the illustrator of many other books for children, including the Aggie and Ben series for early readers and the middle grade series The Adventures of Jo Schmo. Visit Frank online at FrankWDormer.com. "As Eenie and Meenie start cooking, they are shocked to find their missing friend Harold’s sword and shield in their stove. Eenie comically cooks up ridiculous stories about why a shield could possibly be in their stove, while frantic Meenie continues to pull out additional items from their oven. The final punch line, which solves the mystery and ends the book...will leave [readers]...doubled over in laughter.... [Dormer's] choice to use a basic color palette against a mostly plain white background keeps the focus on the characters’s dramatic facial expressions and size differences, which adds to the humor of the piece. VERDICT: A hilarious addition to any picture book collection." * "Two chefs solve one big mystery (albeit too late!) in this humorous spoof on the knight-and-dragon tale. It's mealtime, but where is Harold? Two cooks wonder about their knightly friend—but readers are in the know. He was last seen racing across the title page,searching for the loo. So onward the pair go until: "Holy haddock! "There's a sword in the stove. Who could've put it there? Pirates? The absurdity builds (and so do the laughs) as the oven yields additional items. The pumpkin-headed chefs, like a classic comedy duo, play off each other,channeling Laurel and Hardy in both physique and demeanor; the author juxtaposes their differences to maximum effect. When the two agree the sword is Harold's and his fate a dire one, a fiery whoosh interrupts the question of who would do such a thing. A hungry (and adorable-looking) dragon ready for dessert, that's who! Young readers need not fear, as the last page reveals the chefs and Harold still alive, with a giggle-inducing punch line. Dormer's illustrations fuel the text with their spontaneity and engaging compositions.His primitive watercolor shapes, expressive pencil marks, and clever use of a limited, warm palette reveal a sophisticated control of the medium. Through both text and art, he offers something for everyone (pirates! Vikings!inventive expletives! silliness!). Brilliantly designed down to a typeface that alludes to the story's legendary associations, this book establishes itself as thoroughly modern. A joyful, silly tale for the adventurer, boy or girl, young or old: medieval mayhem at its best." "Dormer’s loose, deceptively simple watercolor figures, composed of blocky shapes and hilarious, over-the-top facial expressions, are a great match for the absurd, slapstick comedy...the comedic timing makes this a tasty treat for kids who love screwy fun."